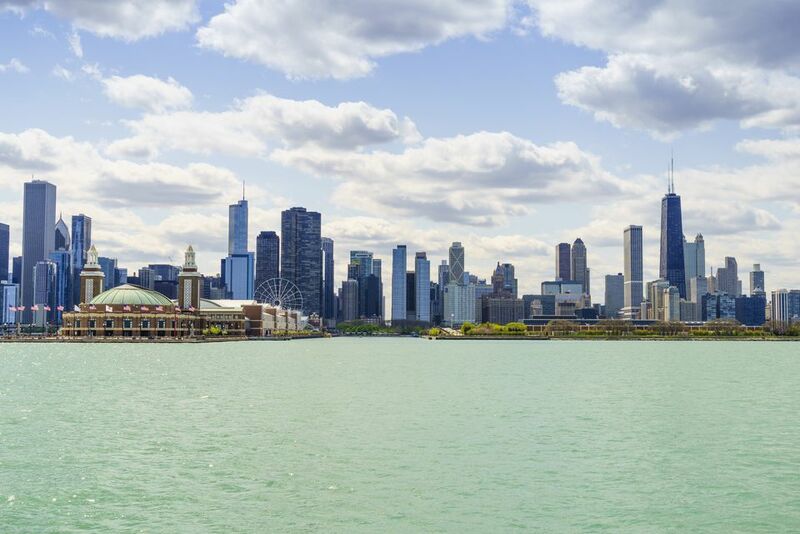 May is a great time of the year to visit Chicago—from lovely Mother's Day brunches to the re-opening of outdoor attractions. Here is what to expect while visiting Chicago in May plus some activities on tap for the month. Have a great time exploring the Windy City! Even though it's known as the Windy City, Chicago in May is more like summertime, as temperatures start the rise and sun breaks through in a departure from springs cloudy, showery days. If you want warm temperatures that aren't too hot, May is a great month to check out this Midwest hub. Chicago averages nine hours of sunlight per day in May, although there is an average of eight rainy days during the month. Dress in layers because Chicago weather can be unpredictable. The city is also notorious for dramatically dropping or increasing in temperature by 20 degrees or more in one day. Regardless of the temperatures, light sweaters or long-sleeved T-shirts, along with jeans, are always appropriate. You'll want to pack a lined spring coat as well as sweaters and scarves in case it gets chilly at night. Bring along an umbrella as well, just in case. Chicago's event calendar is full in May, ranging from the celebration of national holidays like Memorial Day to fun, seasonal events like the Chicago Kids and Kites Festival. Visit Millennium Park's Crown Fountain on May 1 when the fountain is turned on (weather permitting). To celebrate National Burger Month, bite into one of Chicago's best burgers at these great restaurants. Treat mom to Mother's Day brunch at these top brunch spots. Go fly a kite at the Chicago Kids and Kites Festival held at Montrose Harbor in early May. You can make a kite with kids for free, see large-form and sports kites, view arts and crafts, eat a funnel cake, get your face painted, and more. Kites will also be available to purchase. Bringing the kids over Memorial Day? Then check out these family-friendly places to sleep, eat, and play during this extended holiday weekend at the end of May. Don't forget the Memorial Day Parade through downtown Chicago on Saturday. The day begins with a wreath-laying ceremony at 11 a.m. at Daley Plaza, then the parade heads south on State Street from Lake Street to Van Buren Street. Go for a spin along Chicago's iconic Lake Shore Drive at MB Bike the Drive. Enjoy the scenery along the 30-mile, car-free course. After the ride, hang out in Grant Park for live music, food, and giveaways. The benefit ride is open to all skill levels and abilities. Celebrate German heritage at Maifest in Lincoln Square, the heart of Chicago's German Community. The event marks the arrival of spring and features a maypole dance, live music, and German food. The weather in May should be finally warm enough to explore the outdoors. May is when Chicago beaches open, so you may also want to pack a swimsuit, beach towel, hat, and sunscreen. Hotel prices increase due to tourism season heating up. If you're booking a room for May, check out these places that offer Chicago's best hotel room views. There is a chance of travel problems if a storm comes through. If bad weather does cause a flight delay, here is where to dine and drink as you wait it out at Midway or O'Hare airports.